I’ve been really fortunate at the amount of times I am going camping this summer. None of the trips are long, but that isn’t making them any less enjoyable. 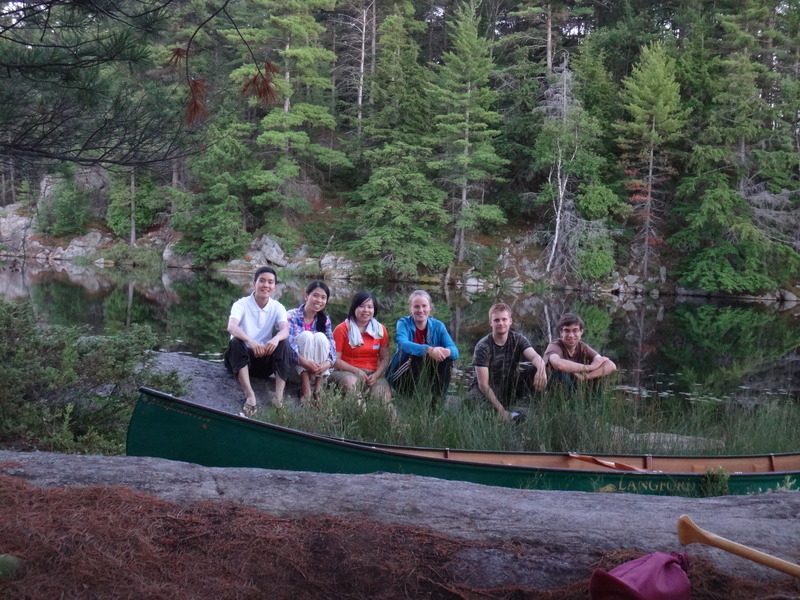 This past weekend I went camping with a mix of architecture classmates and friends of friends. 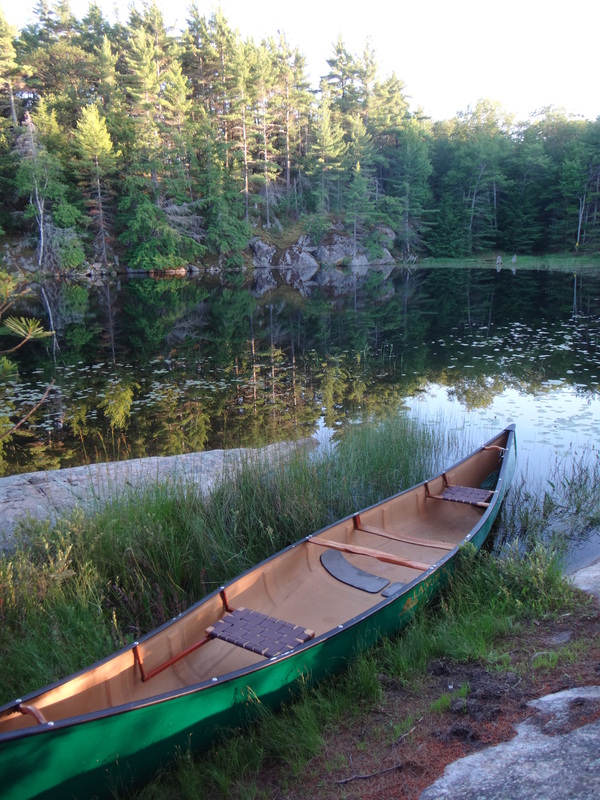 Because we didn’t want to pay the extra cost of renting canoes, I took transit home on the Friday night to pick up the van and my parents’ old canoe. They hadn’t used it in so long that we had actually never tried putting it on the minivan that we have had since 2006! I left really early on Saturday morning to meet the others at the 400 and highway 7. 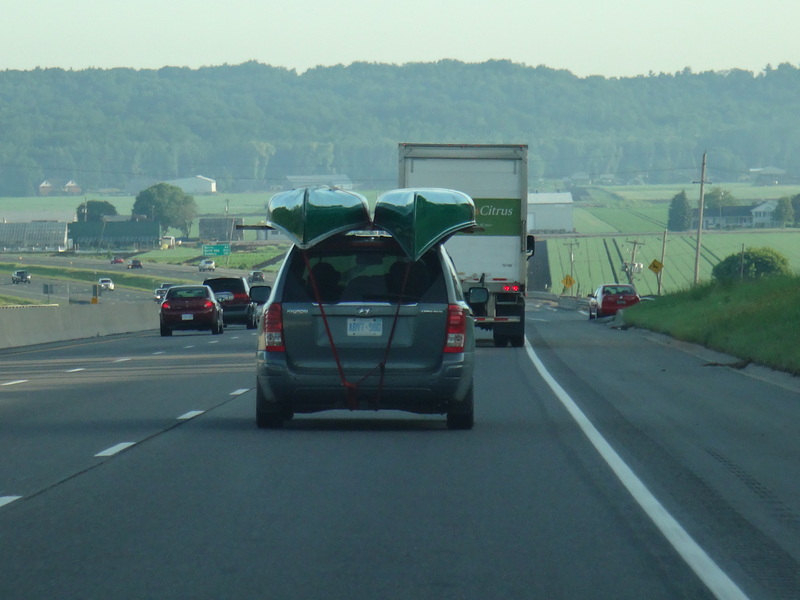 I’m glad that I only had to worry about one canoe on my vehicle because Rachel had two canoes on her parent’s minivan! 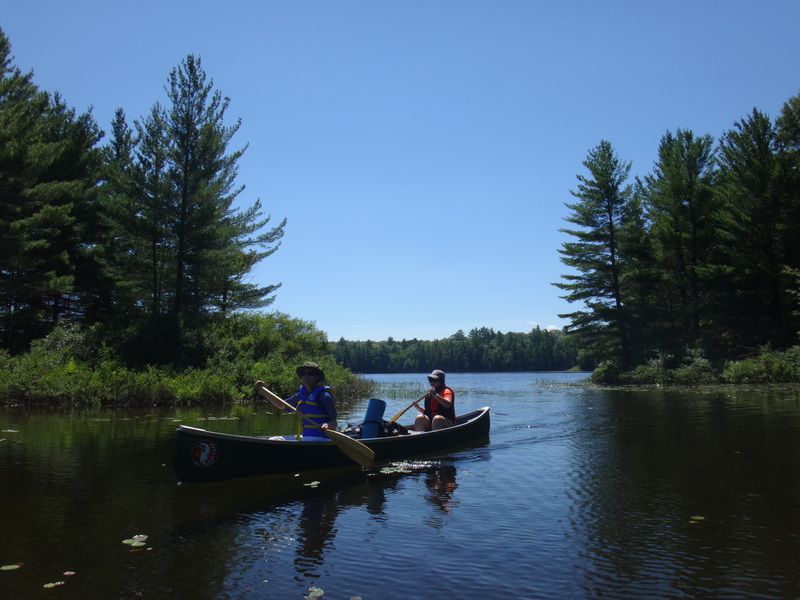 It was very helpful to have two guys in the group who had been on many canoe trips. Vikkie and I were paired with my parents very heavy canoe but we were determined to succeed. We both had some experience with canoeing but neither of us had ever been in the back and steered. I had also never done much portaging. I started at the back and lets just say it was a bit of a slow start. We were doing big S’s for a while as I attempted to master the J-stroke. Let’s just say that hearing my dad tell me how to do it and watching “how to” YouTube videos wasn’t enough and that I just needed the time to feel it out for myself and see how the others were doing it. The journey had its ups and downs. We had five portages to go through in order to get to our campsite. Because we weren’t strong enough and had the heavier canoes, us ladies carried our canoes in pairs holding it on our shoulders from the front and back seats. It really hurt our shoulders after a while because unlike a proper yoke, the seats were digging into the top of our spines. Along the way we tried everything from wearing our lifejacks and towels for padding, or even trying to wear our bags to try to pass the weight onto them. There were some difficult hills and also some areas with very bad mosquitos where you could feel them biting you everywhere but had no ability to swat them away. 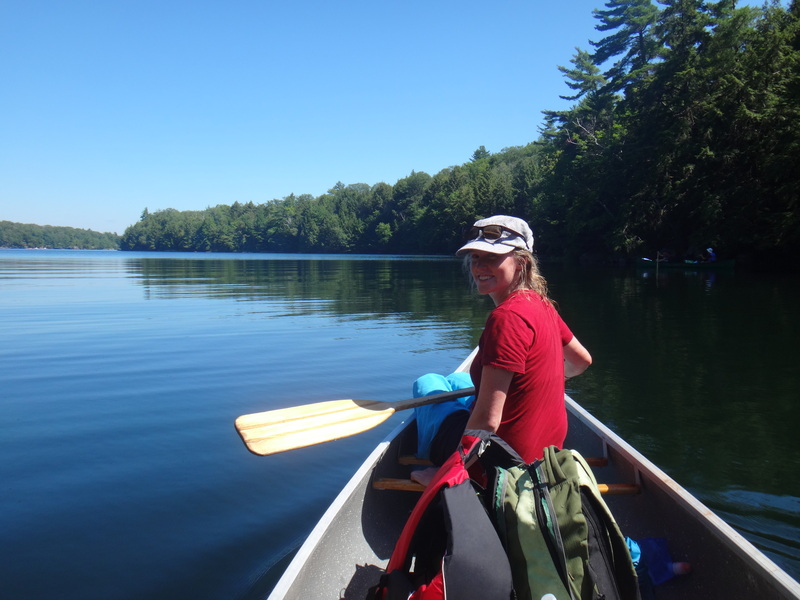 But then whenever we got on the water again, we could almost forget how bad the previous portage was just because it was so calm and beautiful on the water! I definitely think we got better as we went along. 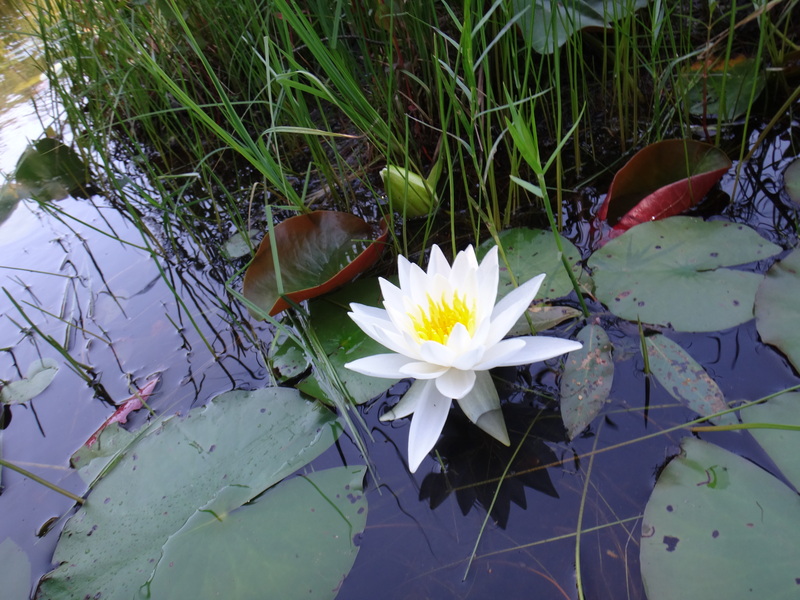 One funny story I recall is when I lost my sandal while stepping into the water to reach the back end of the canoe to lift it out of the water for one of the portages. The mud was very deep and thick and I didn’t even know exactly where I had stepped. I searched for a while and almost resigned myself to the fact that I wouldn’t get it back, when Rachel who was helping me search miraculously came across it! I’m telling you, the chances were slim! Then at the next launch, Rachel very ironically lost one of her bright yellow crocs. She new exactly where she had stepped and it still too several minutes to find it again! We also saw some leeches at one particular spot and so we got better at avoiding stepping into the water. I got less paranoid about scratching the canoe when I realized that my ancient canoe had the best looking underside of the bunch! There was one particularly difficult part in our journey where a portage that was supposed to be 100 meters was actually 500 meters because of the lower water levels. Luckily we managed to shorten down it to 200 on the way there by canoeing through some shallow reedy water, and on the way back we actually cut it back to the original 100 by finding a full way through. 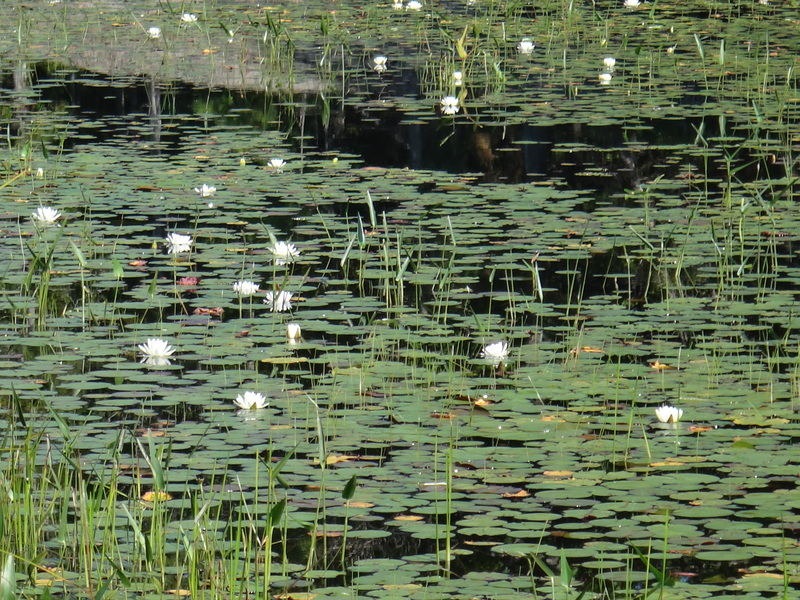 There were lily pads and flowers everywhere; what amazing things they are! We made it to the campsite by five and had a few more hours of sunlight to set up our tents, go for a fabulous swim off the rocks at our campsite, and prepare dinner. We had a whole lake to ourselves! The next day we had breakfast, packed up camp and headed back the way we came. The way home was just as difficult but we all agree it was overall an excellent trip! 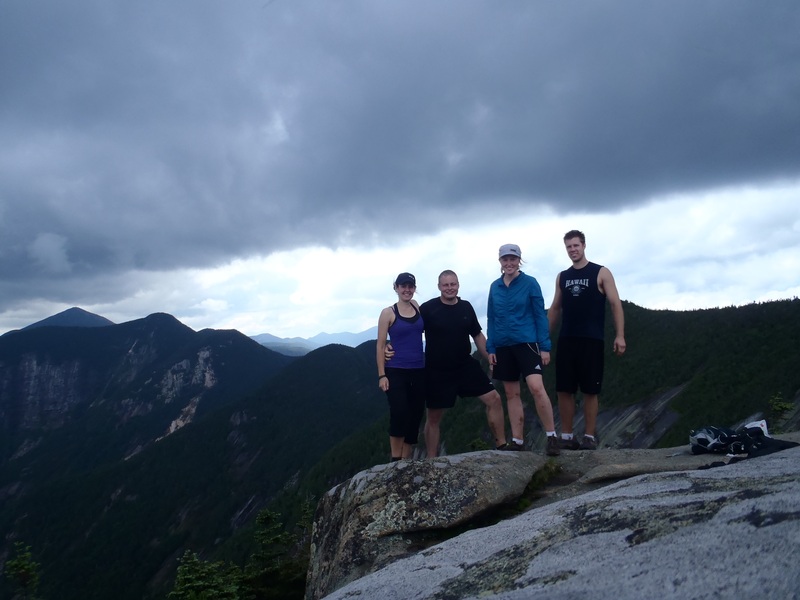 For the long weekend I went with a group of church friends to hike in the Adirondacks near Lake Placid, New York. 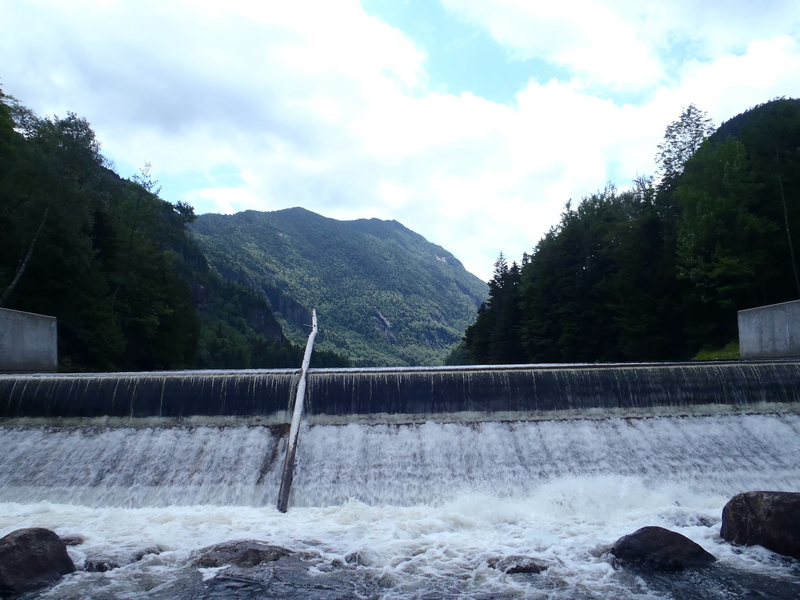 We car camped at a small campground called Wilmington Notch and did two day trip hikes. 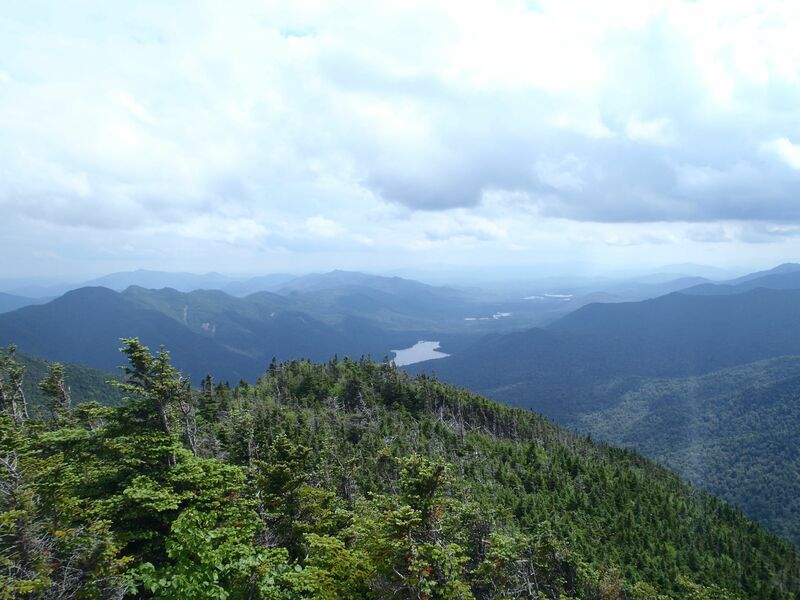 I have learned stuff about the Adirondack mountains. 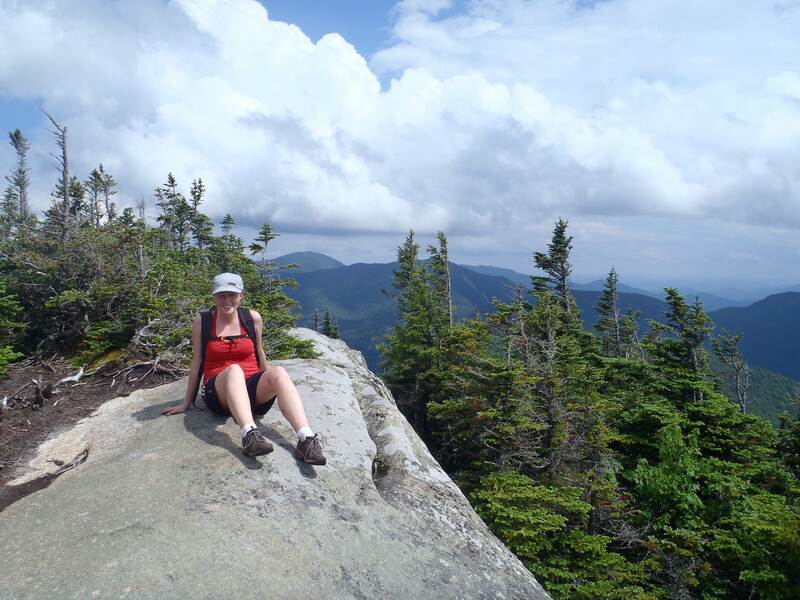 Supposedly there are 46 high peaks (those over 4000 ft) in the Adirondacks and hard-core hikers try to summet them all. We only had time and energy for 3. On the first day we hiked the 36th highest peak called Cascade and the 38th highest peak called Porter. I think we walked thirteen or fourteen kilometers that first day. It was raining for most of the day and the path was very muddy! There was a lot of jumping from rock to rock and I felt sometimes like I was in a video game or something. My feet and legs were absolutely soaked and muddy before we were even halfway up the mountain! The next day we hiked the 10th highest peak called Gothics. To hike this one we had to cut through a golf club, and unfortunately had to make quite a long approach (3.5 miles one way) along a road to the base of the mountain path because the bus that traversed the same route was for club members only. We walked some 22 km that day and my legs were rubber by the end of it! The hike that day was harder but more interesting than the first day and also less muddy because it didn’t rain too much. 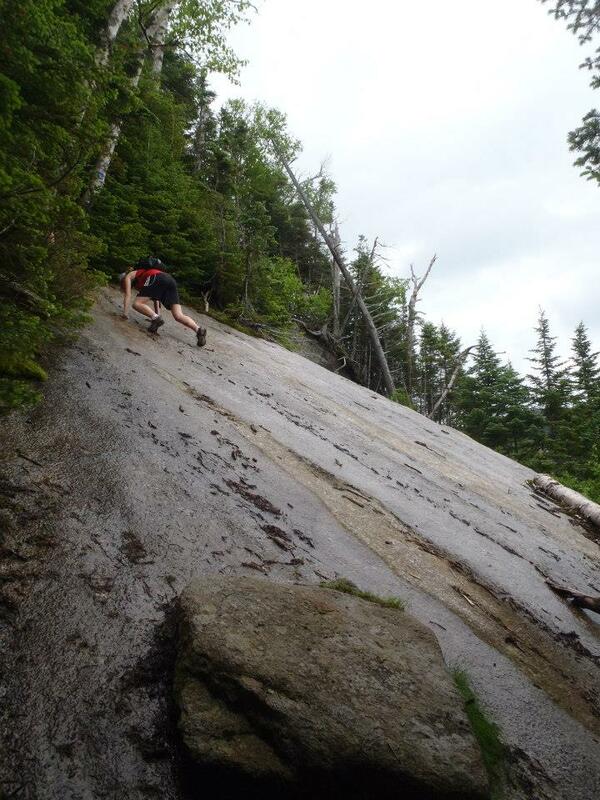 For the last mile we were literally climbing, grabbing onto rocks and roots to help hoist ourselves up. It was my upper body and not my lower body that was sore the next few days! It was well worth it though. We reached the top of a secondary peak called Pyramid, and an amazing view opened up to us at the last moment. It was amazing and we felt like we were on top of the world! When I visit places like this it always reminds me of the might and majesty of God, that He created these mountains and he can move them, and also that he had pleasure in creating this earth and looked over all he had made and said that it was very good. It finally happened… my aging camera finally decided to die. It is quite amazing that it lasted as long as it did since I have a very bad history with cameras. I still remember the time when I dropped my camera in the North Sea on the beach in Scheveningen when I was in Holland visiting family in 2009. Then I remember forgetting my next camera on a train in Switzerland only a year later. This recent one did pretty well. It lasted for two years despite the fact that I got it for free, already old and used, off of a friend from my church. It went to Rome with me and twice to Africa. You can tell it is old because it uses double-A batteries and eats them for dinner. Posso comprare venti pile per favore? I actually got to practice asking this question a handful of times in Italy because I was taking pictures everyday! Now that I don’t have a camera anymore, all motivation to keep up my blogging is gone. There’s something about putting photos up that keeps me much more motivated than just writing plain text. Maybe it’s because I’m probably right to guess that most people when looking at a blog will browse the photos and not take the time to read the words. I will get a new camera soon, but until then I am trying to take this camera hiatus as a lesson. I still want to remember years from now what did in Toronto this spring despite the fact that I don’t have visual documentation. If I’m doing this for me then it shouldn’t matter if anyone else reads it. The few photos I have managed to include are ones that I have stolen off of Facebook. Photos I’m tagged in are hidden on Facebook because I’d rather share the ones I really like on this blog. This way the people who really want to see them will see them. Toronto lies dormant in the winter but comes alive in the spring and summer months. I went from sitting home alone bored to keeping busy with a spectrum of activities! At the beginning of May I went home to visit my parents and also to celebrate Kate’s 25th birthday! Jen picked me up at the Burlington GO station on the Friday evening and we went and joined Kate’s friends and family at a restaurant in downtown St. Catharines. Afterwards we went to a ritzy club (who knew they had those in St. Kitts?) and felt very out of place but still had a good time! I spent the following day with Leah and Anne as they were preparing for Leah’s parents’ wedding anniversary surprise party. 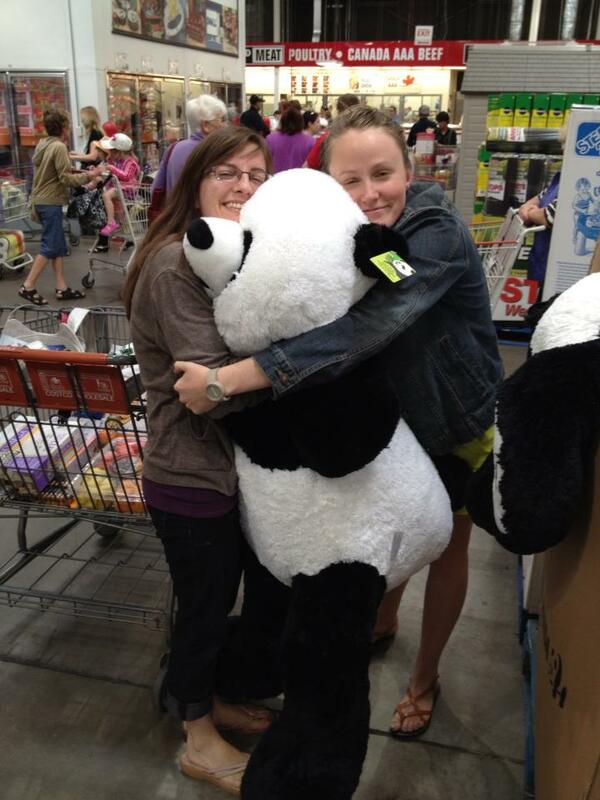 In the morning we went shopping at Cosco (this was a first for me!) with my mom and Jo-Anne, and then the three of us went to Anne’s place and baked and decorated cupcakes. It is times like these when I recognize that the simplest of activities with good and cherished friends can be the most treasured moments! A few weeks later it was my turn to have a 25th birthday celebration. 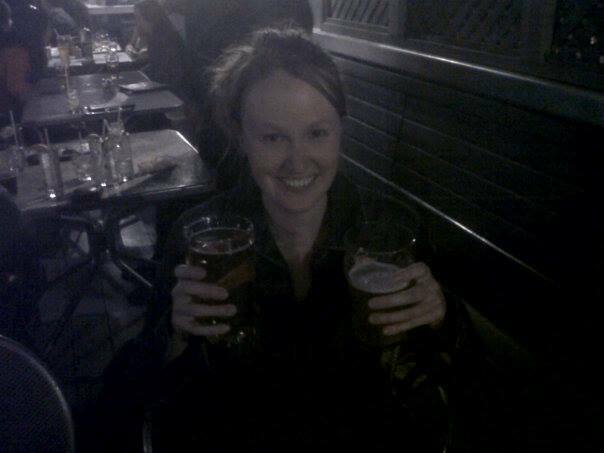 Vikkie and I decided to share our celebration and planned a gathering on the rooftop patio of a bar in the city. I picked The Pilot since I hadn’t been there in years. It was a beautiful night for it and we had a great time! Before heading out to the bar I joined Gerardo and Kate for a sushi dinner on Bloor and Yonge. I will never forget the apple juice incident as the three of us got soaked while we were walking down the sidewalk when a big truck drove over a bottle of apple juice that was on the road and popped it. I don’t think anything has made me jump so high. We slowly took over tables on the patio as people filtered in over time. Lots of friends from Grace came, my two high-school respresentatives ;), and lots of Architecture friends. It was extra special because Andrea came down from Montreal for the weekend and joined us close to midnight. We stayed out until 1am and then those who had arranged to stay with me all headed with me back to my place. I’m very proud that I managed to host three people in my tiny apartment. The next day we went and had a delicous brunch at the Starving Artist a few doors down (oh so dangerous waffle deliciousness). Mila had to head back to Cambridge but Vikkie, Andrea, and I met up with Sneh and spent the afternoon wandering around the city and up to the harbourfront. We layed in the sun on a hill at Sugar Beach for about two hours and it was pure bliss! After that we went to a great Indian restaurant that Sneh directed us to, and afterwards all headed back to my place for what we decided would be a Rome nostalgia evening. Our whole Rome house was there except one (we missed you Petra!) and we watched To Rome with Love and Letters from Juliet, and drank Italian Prosecco and Limoncello! Sneh and Andrea stayed over that night and the next day I went to church and then met up with them again afterwards. By then it was time for Andrea to head back to Montreal. It was such a nice weekend. I love having my birthday on the Victoria day weekend because it means I always get the present of an extra day off. I definitely needed that day for recovery although I still had more adventures to come that week. On Monday afternoon I welcomed a Couch Surfer from Hong Kong who stayed at my place for the next five days. On Wednesday night we went to a Toronto Couch Surfing Gathering at the Artful Dodger Pub that supposedly happens every Wednesday night somewhere in the city. There were probably fifty people there and I met a lot of really interesting people from all over the place. During her stay the girl and I shared meals and she cooked for me twice! That Friday after work I took a late train up to Rachel’s place in North Toronto and met up with Vikkie and Joy because we had signed up for a Toronto amazing-race type event called City Mosaic. We all slept over and then woke up bright and early to go to the event. It started at Scarborough Town Center but then we were sent galivanting around the city looking for clues and completing tasks. We managed to find a happy medium between enjoying the puzzles and yet having a good time. Places we visited were Roncesvalles Village (Little Poland), The Distillery District, Osgoode Hall, University Avenue, The Canadian Blood Services, and Mount Pleasant Cemetery. Adding another layer to the days activities was the Toronto Doors Open festival for which buildings – old and new – all over the city were open to the public. Therefore we were searching for clues and learning about things you normally would not be able to find under regular circumstances. It was a great day! After the event I came home and hosted my 3rd Couch Surfer just for one night – a girl from Montreal who was in the city for a job interview. 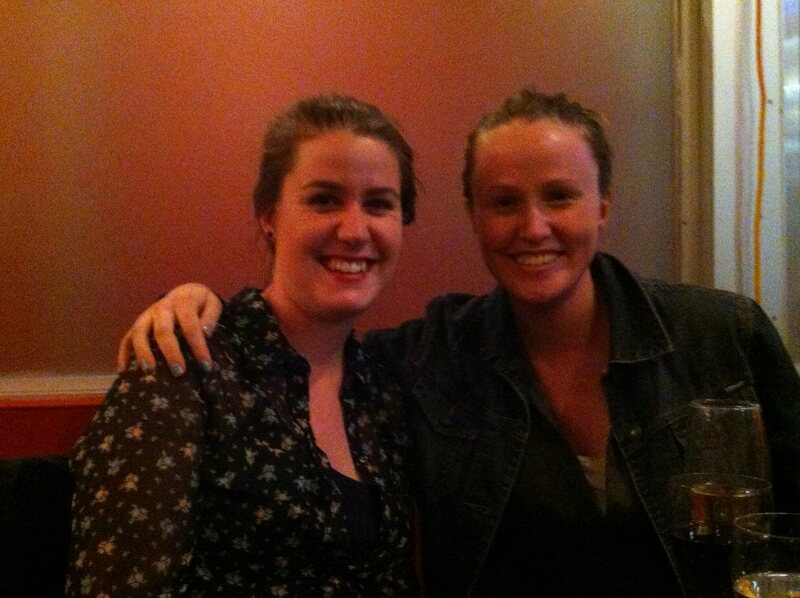 We walked down Roncy for drinks and shared stories from our travels. The following weekend was also full of excitement. A large number of my small group went together for a weekend away to Rosy’s cottage. It was a running joke even before I joined the small group and poor Rosy finally gave into the pressure and generously invited us all. This was my first time to a real cottage! We all drove up on the Friday evening to the Maskokas and spent the weekend just enjoying nature and eachother’s company. Although it was a rainy weekend, we managed to fit in some waterskiing and wake-boarding, as well as a tour of the lake on the motorboat that included a trip for ice-cream. I attempted to waterski for the first time, but after six or seven tries I had to stop because the water was soooo cold. I definitely don’t regret trying though! We had our first campfire of the year on the Saturday night where I tried my first cigar. I think that Rosy’s cottage was the nicest cottage on the lake because it was the only one that didn’t have complete excess. I was amazed by the size of the cottages and how even the boat-houses were the size of a typical house in Toronto. The designs were also far too symbolic of a past era – lots of chalet decor but what seemed like zero design response to the site and the surrounding nature. Cottagers, please keep me in mind and hire me someday to design you something delightful, but also responsive, modest, and environmental. And that, my friends, is a taste of my Toronto spring!